The Rwanda government has said even without donor aid, Rwanda will survive. Foreign Minister Louise Mushikiwabo told the press that Rwanda has proven over time that it can withstand the toughest of conditions and this will be no different albeit with difficulties. "With or without aid, Rwandans will not give up, we shall fend for ourselves as we have always done, in any case, we have done so before," she said. 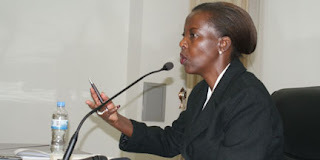 A visibly stressed Mushikiwabo added her government has dealt with several reports full of false allegations before and no matter how long it took, in the end, the truth vindicated them. She cited the long running allegations by the French that Paul Kagame's rebel group shot down the late Habyarima's plane setting off the genocide, but the matter was recently laid to rest with RPF being cleared of all charges by a French judge. On the significance of the threatened aid cuts, Mushikiwabo admitted that though her country needs aid, it's not entirely the basis of Rwanda's prosperity. "Come to think of it, over 50% of our budget is domestically funded and though the balance is expected from aid, you can't dismiss our own efforts as Rwandans and if we need to survive without aid, we shall do it," she noted. But she added that Rwanda needn't fear as the country has many friends who have stood by it since the end of the genocide. Meanwhile, Rwanda's Minister of Finance and Economic Planning has revealed that the Government will be forced to increase domestic borrowing to counter the impact of delays in disbursement of funds to the national budget by donors. Germany suspended $26m to Rwanda's budget planned from this year through 2015, while the Netherlands delayed US$6.15m also in budget support. Though Rwangobwa sounded optimistic that affairs will improve concerning the UK, he added that Netherlands and Germany were not clear in their decision saying it's compromising the policy on aid effectiveness. Rwanda plans to boost its national 2012/13 budget, with Rwf297 billion from development partners in form of direct budget support compared to Rwf279 billion in 2011/12. The aid delays came after reports that alleging that Rwanda is supporting M23, a rebel group in the Democratic Republic of Congo, allegations Rwanda has denied. On Monday last week, Rwanda submitted to the UN Sanctions Committee its rebuttal on allegations contained in an addendum to a Group of Experts report that claims Kigali is backing the M23 rebels, who have, over the last two months, seized parts of eastern Democratic Republic of the Congo (DRC). "There wasn't a trace of truth in their allegations and we have provided evidence and facts that will only expose the report as some dark plot aimed at an equally darker agenda," said Foreign Minister, Mushikiwabo.